Sead Kolasinac’s injury has given Arsenal manager Unai Emery a big problem just days before the start of the new Premier League season. The Gunners take on Manchester City in their opening league match this weekend and face something of a crisis at left-back as Kolasinac has been ruled out for ten weeks. 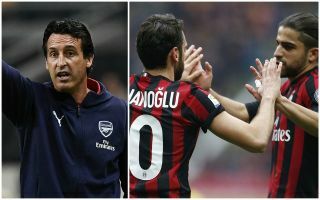 The Daily Mail now claim this and Nacho Monreal’s lack of pre-season action has led Emery to consider a late £30million swoop for AC Milan’s Ricardo Rodriguez to solve that problem position. The Switzerland international is a fine player and arguably looks a real bargain at that price if Arsenal could pull it off. Ricardo Rodriguez set for late Arsenal transfer? Would Ricardo Rodriguez be a good signing for Arsenal? The Mail claim that’s all it would make for Milan to consider a sale, with the Kolasinac injury perhaps looking a blessing in disguise as it gives the club the chance to potentially bring in an upgrade for a very reasonable price. It remains to be seen if Arsenal will be able to conclude any late business, but they’ve largely been efficient in the transfer market so far this summer, having sorted the signings of Bernd Leno, Stephan Lichtsteiner, Sokratis Papastathopoulos, Lucas Torreira and Matteo Guendouzi with minimal fuss.